Summer is in full swing. 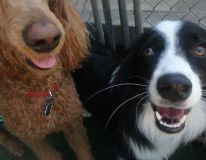 The dog days of summer are upon us. It is hot. The State of Alabama is a great place to be in August, due to the many stunning locales to cool off. In the frenzy of activity to pack up your family and your supplies, things that should be rather high priorities may find themselves to be overlooked due to the variance from routine. So, the trunk of the car is full – you’ve got your kayak, the dog food, clean up bags, your yoga mat, the dog bowls, treats, your bags, your favorite coffee, your kids’ bags, all the favorite DVDs and bedtime blankets. Pretty much all the basic stuff for the last camping trip, right? But, if you’re headed for a swim or a splash, don’t forget your dog’s life jacket! On lake trips as a child, I remember some people thinking it was weird for kids to wear life jackets, and it was truly unheard of for a dog to wear one! Having both a Golden and a Golden Retriever (brother and sister, even!) 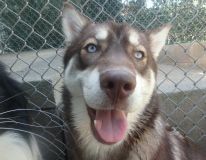 I always had one dog that loved to swim and fetch (the boy one, Eeyore) and one that only liked to dip her toes in (his sister, Ruhni). So, when Ruhni was big enough to go to the lake, she always had a life jacket because we were afraid she’d fall in. Since then, we’ve been through lots and lots of life jackets for both of them, and we’ve learned a lot along the way. Thankfully, these days society has realized the value of safety for our dogs, and life jackets for dogs have come a LONG way. 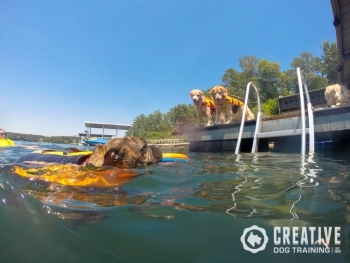 Your dog’s life jacket has to have more foam flotation on top than on bottom. Which direction will your dog float if she falls into the water? You don’t want her to end up stuck on her side (as has happened to poor Ruhni), or otherwise stuck and in danger. 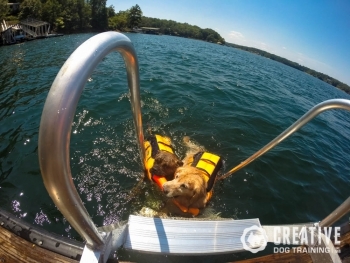 Proper flotation placement will help your dog into the safest position to allow her to swim, and to make the handles on her life jacket accessible to you. Padding on the chest strap has the dual benefit of preventing your dog from being choked if she must be lifted out of the water, and it can help hold your dogs head above the water when swimming, helping her feel a little more comfortable! 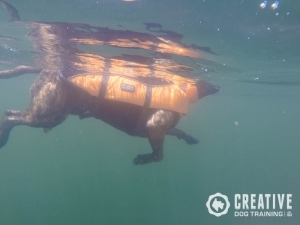 Since the ability to lift your dog back out of the water is so important, the life jacket should have very secure integrated handles, preferably a cohesive construction with the straps that run under the stomach. Be weary of life jackets designed for style more so than function. Look closely at how the handles are attached to the life jacket. Look at how the life jacket fastens. We had an Aussie Naturals life jacket that didn’t last through one full weekend due to the stitching falling apart. Conversely, the Outward Hound (Buy it Here via Amazon: Kyjen Outward Hound Pet Saver Life Jacket, Large, Orange ) life jacket integrated the stitching along the handles into the connecting straps for the jacket, and never had a bit of a problem! 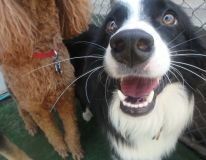 It is ideal to have more than one type of connection, such as having both Velcro and a buckle strap across the dog’s belly. 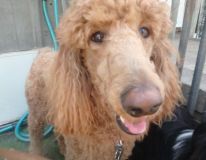 Having two connections allows an extra level of safety and security - especially if you need to pick your dog up with the handles. I bought a life jacket that had a leash ring on it, and man, was it convenient. Now that I have a dog who is older and a little wobbly-legged, it was great to be able to securely direct him while we walked around. 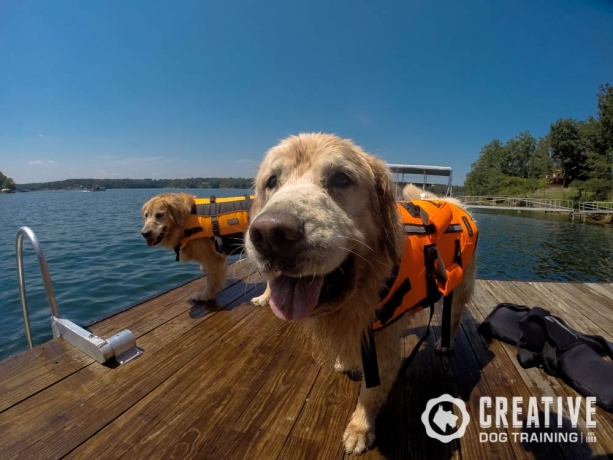 Now that you’ve got your life jackets, here are some other points to keep in mind to make the best of your outing with your dog. Beware the Splash Zone. If your dog will be jumping into the water (for instance, into the lake from the dock), watch for people, objects, or other obstructions directly under your dog’s jump path. It took us only one time of being jumped upon to realize how much space was needed between ourselves and the dogs on the dock. If you think it’s quite warm outside, try wearing a fur coat out there. Don’t let your dog get over-heated. Make sure your dog has shade to retreat to, and try to avoid the sun when it’s the strongest: directly overhead at mid-day, roughly 11am-3pm. Remember to give your dog access to drinking water. Even though they’re surrounded by it, they may not be able to manage to drink it. Remember to take your dog on potty breaks, too. If she is unfamiliar with bodies of water, she may be confused as to where is okay to go. As always, watch your dog’s stress level. Yawning, panting, or food refusal/not taking treats means it's time to go. Now Go out there and Enjoy this perfect summer! Links we mentioned in this blog. Podcast: Using NO - Listen to our tips for using the Command NO effectively for unsafe and dangerous behaviors. Podcast: Your Relationship With Your Dog - Listen to our tips on building your relationship with your dog, and how to get the most out of it. 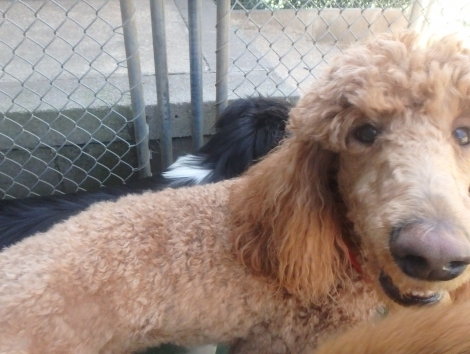 Podcast: The Language of Stress - Listen to our tips on observing the language of stress in your dog, and how to recognize the phases and turn them around. Podcast: Traveling With Your Dog - Listen to our tips on Traveling with Your Dog. Its all about safety, happiness and preparation! Podcast: Good Games to Play with your Dog - Listen to our tips on some good games to play with your dog to help in training and building the relationship.